This document is being discussed on another thread along with some unfortunately knowing nothing about it. So here it is. “Hello Washington Street!” vision plan is the City of Newton’s initiative to proactively plan the future of Washington Street in Newton, MA. 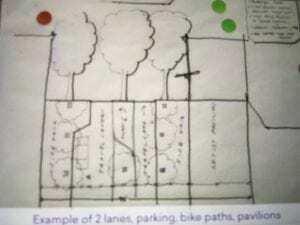 Public Design Week June 5-12, 2018 was an extensive planning week to generate ideas and to study options for Washington Street. The following Snapshot is a mix of what we heard from community members and samples of the scenarios that were studied and discussed. Compiled by City of Newton Planning Department in collaboration with Principle Group. That yellow line is such a pipe dream that it seems inappropriate to include it. One thing that was not addressed in any of these meetings is whether or not we want this area zoned for retail recreational marijuana stores. The Newton planning committee has proposed zoning most of these areas along Washington St. to allow recreational marijuana stores. That will change the character of the area beyond what most people have been envisioning, and the city should ask for input for that as well. Newton citizens may think that will be a great addition to the mix, but they should be asked about it and get input from a broad swathe of residents. I’m intrigued by the graphic titled “Road Layout Options” which shows everyone driving on the left side of the road. Trying to decide if this was just lifted from a British or Australian document or a proposed initiative to decrease traffic in Newton. I notice on page 27 they are depicting a new NPD headquarters on Craft. Has anyone heard any more about the mayor’s proposed land swap? I agree with MMQC what’s with the yellow T line? The whole purpose of the Hello Washington St is a still mystery to me. The options were so wide and varied they seemed irrelevant. For example, page 10 the picture of the European cafe street. What is the point on polling people on it? We know people like these areas – that is why they are tourist attractions. How is this relevant to Newton? Call me a cynic, but I think the whole purpose of Hello Washington Street is to give residents a sense of control over the development that’s going to happen. I don’t think the developers are interested in our input and the pictures that we chose from in the poll prove that. Washington Street isn’t going to become a cozy little Mediterranean village. @Mary: You are a cynic. Others: This whole presentation is clearly presented — and labeled — as “brainstorming”. And the yellow line is presented as a “big idea.” It’s not claiming to be anything different. MMQC – there actually has been real discussion of running a new rapid transit line (the Indigo Line) from Riverside via the existing commuter rail tracks. Who knows if it’ll ever happen (the link below is from back in 2014), but the concept of something like that yellow line isn’t *completely* pie in the sky. I’ve read about that before, but I think part of the reason that I found it odd that they included it is that it isn’t something that has anything to do with the developers and would rely on the state, the MBTA, etc. I think having that T line would be amazing but I would rather we look at things with a more realistic eye. Adding things to the snapshot that are out of their control and unlikely to happen is distracting and misleading. The MBTA bus system is occasionally called the “Yellow Line” by transportation geeks. You know, because the buses have yellow on them. So this new “Yellow Line” means trying to convince the MBTA to add or alter a bus route. It’s important to remember that the city’s goal for Hello Washington Street isn’t to generate development. It’s to generate a zoning plan to direct development. We actually CAN have a lot of control because all this input is helping to clarify what we want to see built and how best to control for it. Many city planners have the goal to increase the MU4 zones between Washington St. and Watertown St. The aim is to provide a significant increase in dense housing units, particularly on the north side between Newton Corner and West Newton. Residents in Newtonville and West Newton will lose control of their property values as this evolves. RuthAnne supports these significant land use changes. Seventy per cent of residents do not like any of the proposed zoning changes. The city wants to also move the permitting process to an appointed Planning Board for any development less than 20 units. This alone means development could increase at a very rapid rate. This part of the visioning process was to present options being considered and listen to the community feedback. This Snapshot should be only the results of that process since is supposedly what Principal Group learned from this community engagement. It’s truly comfounding that the police station shows up on Crafts Street. Well, actually it’s more than comfounding. It portrays a scenario that needs to be scrapped completely. A group of gualified people need to determine where to build a new police complex, the amount of land necessary and what it should include, not a developer. The Craft’s Street location won’t serve to build a police station that works well now and in the distant future. Colleen, as usual you cite numbers without including any backup. Where on earth did you come up with what 70% of Newton residents do or don’t want? I hope that those of us who live within a block of Washington Street at some point get to participate in a development “brainstorming plan” for Commonwealth Ave. I’d like to see some MU4 developments go up across from City Hall. I mean, the whole town gets to “help” us, it’s only fair we get to return the favor. You’ll never see these MU4 go up anywhere near these prime locations. BTW, I wonder what miracle could get us the yellow line. Even if a million people lived on Washington street, the MBTA is so incompetent it would still never get built. @Rick Frank, @bugek – You are right. There’s not likely to be any MU4 development on Comm Ave at City Hall since MU4 zoning is explicitly for village commercial centers. @bugek none of the above. It’s a way for an individual developer to take advantage of a city that was asleep, and now the city has to post hoc plan for the fact that the developer has bought up most of the street, and pretend that we have some say in the matter, when in reality, we have no say, and I resent the fact that the whole city gets to decide what those of us who live within a block or two of the street get to live with. But the reality is that those people don’t either. The developer and the mayor will get to d3cide what we all have to live with. We may not agree, but I do understand what you are feeling. I felt some of that when Newton North was being reconstructed, and in the beginning especially I was worried it was going to ruin my neighborhood, that the high school kids would be taking over the parking, that the traffic would be awful, etc. And many years later, I think it largely worked out. Not perfect, but the city tried to make things right in the end. It took a fair number of meetings, multiple years of effort to try and deal with the parking, and traffic wise I think it is never going to be perfect. But the city did try to make things work. The reality for both of us is that we live near busier streets, and the zoning allows certain amounts of size already. I think the city has been behind on zoning issues for quite some time, but decisions have never just been a local neighborhood decision, as frustrating as that can be. You are correct that there is some inequity in our system. I don’t think your comparison to Commonwealth or Beacon is the right one to make. I think you should have said Waban Village center or Newton Center green/parking. Because if they build big on Washington Street, I think there should be another discussion long term for those areas as well. I’ll note that traffic wise I don’t think density works everywhere, but density does work to some degree in village centers. First floor retail, second floor office, 3rd and 4th floor apartments tends to work everywhere there is a village center. Regardless, living near a potential construction project that can change your enjoyment of your property in the short term and the long term is a stressful and frustrating change. Folks can say you “take your property as you find it” (meaning you chose to live near a larger street), but that is with the benefit of hindsight and also ignoring the very real impact you had no way of predicting when you bought. It doesn’t mean I think your local street or mine should make all decisions in a vacuum. But it does mean I sympathize with your position. Early on I was saying it was “Goodbye Washington Street; Hello Cambridge Street”. Who’s willing to put some money on this? No matter. We all lose. Right now the state money is going toward regional transit authorities and the gateway cities. We’re not included in those. We can’t expect the MBTA to fund improvements to our commuter rail stations in the near future. If Newton wants to build new stations, it will have to be a city-corporate deal. Mark Development sure seems to have a lot of money and new ADA compliant stations would improve their prospects for attracting renters. I really wish we could get an answer about why the Snapshot shows the police station on Crafts Street. That’s not from a brainstorming session. Hasn’t that proposal been scrapped yet? Is “Hello Washington Street” based on the very popular children’s toy “Hello Kitty”? The move of the Police Station to Newton Corner/Nonantum does seem completely based on the interests of a developer, not the ease of access to the whole city from the Police Station.